We recommend that you keep your sugar treats and drinks to your three meal times and in-between snacks on more savoury items, such as cheesy-strings, celery sticks, tortilla wraps and milk. We also tend to talk a lot about the acidic foods that we find in our diet now. A lot of us will try to make sure we take in our five portions of fruit and veg a day, in order to do that we may have a fruit salad for breakfast. However this acid will soften our enamel, which can then be brushed away. The best thing to do is to swap for your fruit bowl to lunchtime so it is well away from when you brush. It can feel really hard however, to know exactly what you can eat that is good for our health but will not affect our teeth. The team at ap smilecare also love eating and we are not always true to our healthy eating guidelines. 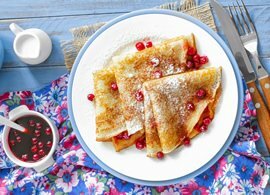 However we set ourselves a challenge to come up with some tasty pancake fillings that tick the healthy eating box but reduce the damage we can do to our teeth over the day. Mardi gras is an alternative term for Pancake Day, meaning Fat Tuesday! This will definitely set you up for Carnival or alternatively a hard working day in East Lancashire. Savoury pancake, layered with smoked turkey, tomato, guacamole, chilli and grated cheese. Savoury pancakes, without the sugar can be used a little like lasagne sheets. Adding cheese to a dish is a great way to neutralise any acid that comes from the veg! Layers of pancake separated with passata, roasted veg and creamy ricotta topped with a nutmeggy Béchamel sauce. Kids, As we said, keeping sugar treats to our three meal times is fine, just don’t forget as long as we try to stick to this and we are brushing after breakfast and before we go to sleep we are allowed this. The night before blitz natural yoghurt with strawberries, blueberries, raspberries and freeze. Serve the next day on traditional sweet pancakes with a drizzle of melted chocolate.